So many of the toys available today are mass produced, plastic, commercialised and increasingly associated with TV, movies or computer games. As I work with children, I wanted to make toys that would be developmentally stimulating, simple, high quality and lovable– the way Real Toys should be. 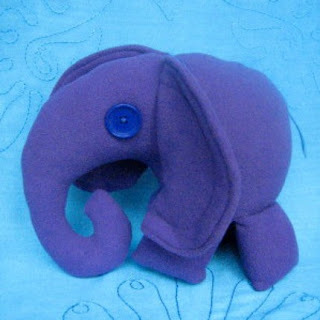 Each Real Toy is an original design, individually handmade and stuffed. Features are carefully chosen at the last stage to bring out the unique personality of every one. As they are crafted individually, each Real Toy is one of a kind. Recycled clothes, scraps and remnants make up the eclectic mix of fabrics used. They are chosen based on their visual and textural appeal, as these are important in stimulating the senses of young children and developing their knowledge of the world. Being resourceful in the materials I use contributes in a small way to the environmental problems we face, as well as demonstrating that everything need not be brand new to be beautiful. Please note: Although great care is taken to affix buttons securely, they are not recommended for children under 3 as they could pose a choking hazard. I agree completely with Real Toys and wish them well in their efforts to provide toys for children from recycled/salvaged goods. If you don’t know about Etsy,it is a place for people to buy and sell handmade goods. There are many unique items available, and I could spend hours perusing the content. Etsy is also a great place for artists and crafts people to find inspiration. I think this is such a fun concept. I try to do this as often as possible with my daughter. I think children can learn a lot more from these handmade items from recycled materials. Also, they’ll have the cool factor among their friends because they’ll have something that no one else has. What could be better than that?! This is also a fun activity to do with your child, if you can’t afford to buy one. Thanks for sharing the link. I love your blog! Little things like this will be what saves the earth. Wal Mart and their CFL’s be darned. One of daughter’s favorite toys when she was a kid was a pillow bear that I made out of an old quilted robe of mine. She liked it so much we had to recover it several times to prolong its life. Great recycling ideas. Hank D and the Bee: More Eggs, Cheese, and Milk, Please.